A myriad of infectious diseases may course with a combination of movement disorders and cognitive decline. 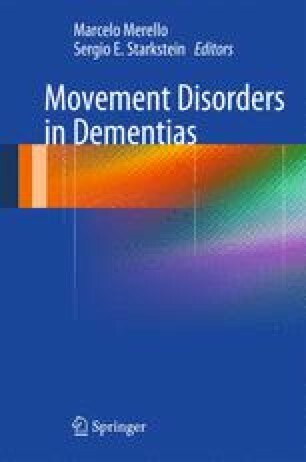 The spectrum of movement disorder in these conditions is varied, ranging from parkinsonism to a multitude of hyperkinesias, including tremor, dystonia, chorea, and myoclonus. As to the profile of cognitive changes, the most commonly found abnormalities belong to the so-called subcortical dementia. Among viral infections, postencephalitic parkinsonism and HIV infection are examples of conditions combining cognitive and movement disorders. The former is just of historical importance since it vanished as mysteriously as it started. The majority of HIV+patients develop neurologic complications despite the advent of highly active antiretroviral therapy. A substantial proportion of these patients display the combination of movement disorder, particularly parkinsonism, and cognitive impairment. Neurosyphilis, a spirochetal infection, is also historically relevant, but it remains as an important cause of dementia although movement disorders are rare. Prion diseases are uncommon and their infectious forms are even rarer. Nevertheless, they should always be ruled out in patients with rapidly progressive dementia and myoclonus. Neurocysticercosis, the most common parasitic disease worldwide, is increasingly recognized as a cause of cognitive disorder although movement disorders are exceedingly rare in these subjects. Finally, although the incidence of Sydenham’s chorea is in decline, it remains as the most common cause of acute chorea in children and not infrequently it is associated with a dysexecutive syndrome.